Sunrisers Hyderabad (SRH) will face Mumbai Indians (MI) in the match no 19 of VIVO Indian Premier League (IPL), 2019. The game will take place at Rajiv Gandhi International Cricket Stadium, Hyderabad which is SRH home ground. 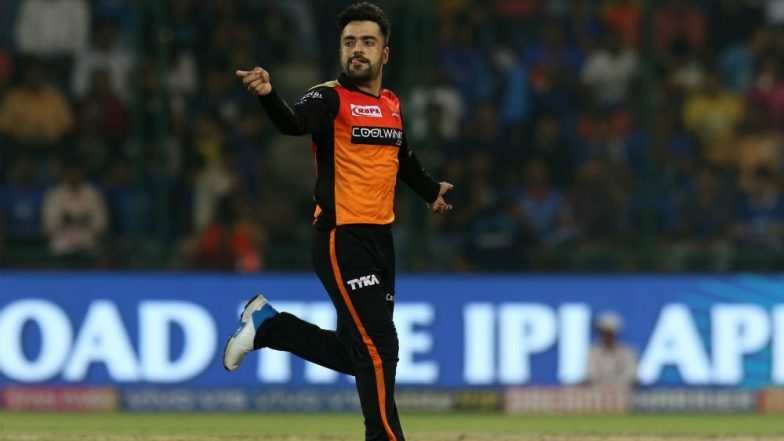 Ahead of SRH vs MI, Hyderabad shares a record of their spinner Rashid Khan bagging two Man of the Match award against Mumbai in IPL 2018. Ahead of SRH vs MI IPL 2019 Clash, Jonny Bairstow, Bhuvneshwar Kumar & Other Sunrisers Hyderabad Players Wish Fans a Happy Ugadi! Watch Video. The Afghan all-rounder Rashid Khan is the star player of the orange army. Khan helped Hyderabad reach the final of IPL season 11. In this on-going IPL 2019, we have not yet seen much the destructive side of Afghanistan spinner. However, his economy rate is what that has played a vital role till now in this season too. SRH star spinner Khan also bagged Man of the Match against Rajasthan Royals (RR) for his figure of 1/24 in four overs and a crucial unbeaten cameo of 15 runs from 8 balls. SRH vs MI Head-to-Head Record: Ahead of IPL 2019 Clash, Here Are Match Results of Last 5 Sunrisers Hyderabad vs Mumbai Indians Encounters! Rashid Khan record over Mumbai Indians might give nightmares to Mumbai Indians. MI must have planned some strategy to face the SRH strike bowler Khan. SRH won their last game in IPL 2019 against Delhi Capitals (DC) where they chased down the total of 129. The right arm leg spinner of SRH finished with figures of 1/18 in four overs against DC. Mumbai Indians too won their last game against defending champion Chennai Super Kings (CSK), as CSK were unable to score 170 posted by MI. Mumbai will be missing their pacer Lasith Malinga tonight, as the Sri Lankan has gone to his country to play domestic ODI tournament. Malinga will not be present for Mumbai side in their coming three games in IPL 2019.